There is something about standing at the top of the world that takes your breath away. Maybe it’s the elevation. At 17,000 feet and some change, there’s not a lot of oxygen in the air, particularly if you’re used to living at sea level, like I am. Or, it could be the view. Not many people are lucky enough to have the opportunity I had: to look the Goddess Mother of the World, Mt. Everest, square in the face. Yet that’s exactly what Big Papa and I did when we visited Tibet in 2008. Temperatures were in the teens, and there was nothing between us and the mountain of all mountains, except an open plain and a fierce wind. Being in Tibet, and seeing Mt. Everest, was unforgettable. And so was the tea. Back at the Everest Hotel, we headed for the sole dining room and ordered up a big pot of chai. Sensuous aromas of cinnamon, cardamom, clove, ginger and pepper filled the air. I will never forget my first sip: warmth soothed my cold throat and the flavors were simply irresistible. Big Papa and I joyfully drank the entire pot with ease. 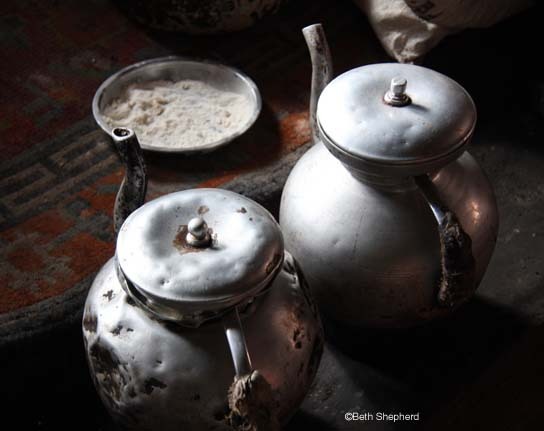 In much of the world, including Asia, Eastern Europe, parts of Africa and Brazil, “chai” means tea. Chai tea, frequently called “Masala Chai,” is an aromatic blend of black or green tea infused with warming spices and typically served with sugar and milk. 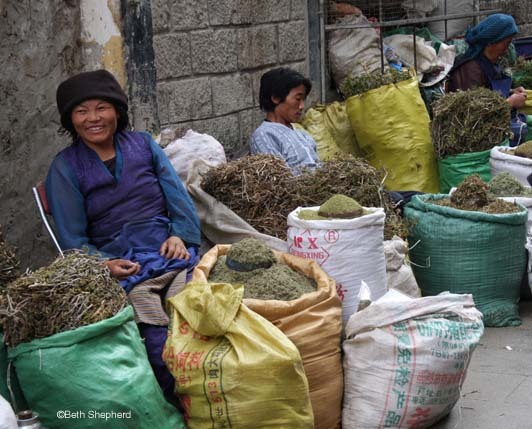 If you travel to India, Nepal and Tibet, where chai originated, you’ll likely see vendors peddling the tasty brew on street corners or at train stations. According to Ayurvedic tradition, chai boosts the immune system, enhances metabolism, relieves stress, aids digestion and sharpens the mind. Never mind that it’s also out-of-this-world delicious. 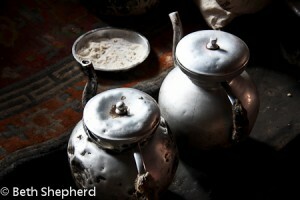 I still drink chai, though I’ve never had a cup that was as good as the chai we drank while traveling in Tibet. The Goddess Mother of the World had a way with tea. She worked her magic on our chai…and on us. 1. Bring water to a boil in small saucepan. Add cinnamon, cover, remove from heat; steep 2 minutes. Return pan to heat; bring to a boil. Add tea, spices, milk and sugar; cover, and remove from heat. Steep 3 minutes. 2. Pour mixture through fine wire-mesh strainer into warm teapot, discarding solids. Note: If you prefer, omit the milk and sugar and offer them separately. You can also experiment by adding fennel seeds, coriander seeds, nutmeg, star anise, and lemon or orange peel to create your own unique chai blend. Want to take your breath away with more deliciousness? Check out Wanderfood Wednesday! Big Papa has an expression he’s fond of using.” I haven’t [insert phrase here] since the high slopes of Everest. For example, “I haven’t seen this many pigeons since the high slopes of Everest,” which is a true statement since we did indeed see pigeons at Everest Base Camp. So this past Friday as we sat having lunch at Tom Douglas’ new restaurant, Ting Momo, Big Papa said, “I haven’t had yak like this since the high slopes of Everest.” And why wouldn’t he say that? Because the last time we had yak was on the high slopes of Everest. Sitting in a Seattle café, cute as it was tucked into an historic brick building in Seattle’s gentrified South Lake Union business zone, is not like being in Tibet. And yak from the high slopes of Colorado, while tasty, didn’t hold a yak-butter candle to the real deal. Or maybe it’s just the hard, cold reality that Tibetan food in Seattle is not the next best thing to being there. I know both Big Papa and I long to return to that magical place, but for the moment city yak is all we’ve got. We each ordered momos, Tibetan steamed dumplings and a cup of Thukpa soup. Big Papa chose a can of Tibetan tea (made in Bellevue, Washington no less!) and I asked for a glass of warm Chai. The thukpa was made with hand-pulled noodles, red pepper, shitake mushrooms and coconut milk. It was spicy with a lovely kick and tasty though I don’t remember thukpa like this when we traveled in Tibet. I ordered the momo combo with two yak momos and two shrimp momos. Big Papa went yak momo all the way. 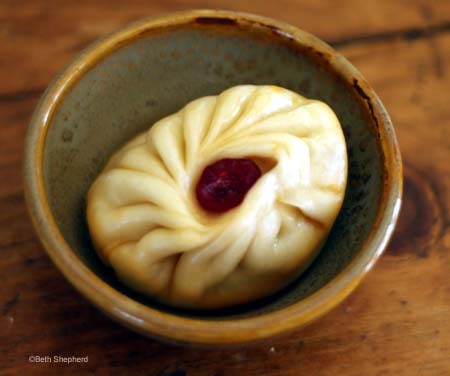 The yak momos, in my opinion, were by far the better treat. Golden Colorado yak (yep, yak are trekking in the hills of the U.S.) were spiced with star anise, bay leaf and a cranberry on top. Cranberry? That seemed a bit odd to me. Tibetan fusion food, I guess. My momos were middling. 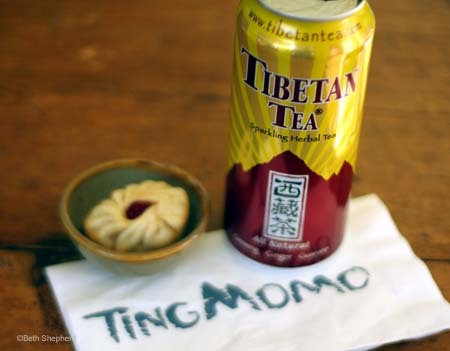 If this is as close to Tibet as I can get, I’ll visit Ting Momo again though I wish the Chai had been richer, the momos lighter and crispier, the staff friendlier. For $35, I hoped for a bit more enlightenment. 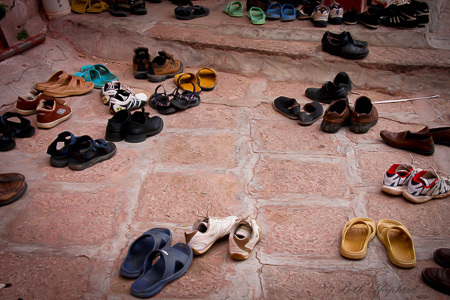 As I walked toward our car, all I could see were modern high rise buildings–there were no pilgrims circumambulating in prayer around me. Car exhaust replaced the sweet scent of burning sage hanging in the air. And sadly, very sadly, melt in your mouth momos and the high peaks of Everest were just a distant memory. Want more to yak about? Check out Wanderfood Wednesday! Thwap goes my hand, as I smack it down hard on the table, leaving one mortally wounded fruit fly. A remaining undamaged silvery wing twitches a bit before I flick my fingers and send the fly sailing over the table’s edge to its demise. We sit in silence for a few minutes waiting for our meal to arrive at St. Clouds, one of our favorite Seattle neighborhood restaurants. Soon Big Papa is reveling in ribs swathed in barbecue sauce while I savor mussels bathing in coconut milk. Twenty or so mussels nestle inside my bowl. By Buddhist interpretation I am devouring a small village. Steamy broth sends tendrils of heavenly spiced aroma to tickle my nostrils. I close my eyes, remembering. Mere days ago we sat at a café in Lhasa, Tibet. The memory seems surreal, yet I can almost see the soft afternoon light filtering through the window of the café as I hold a warm cup of Masala tea in my hands. Its milky spicy fragrance surrounds me. Outside the window, earnest merchants in the Barkhor haggle with persistent tourists over the price of prayer wheels. Weathered pilgrims chant while circumambulating clockwise around Jokang Temple. Smoke rises from branches of juniper placed on outdoor incense furnaces and mingles with the intense sweetness of yak butter candles. As the sun slowly lowers itself to the horizon, the light becomes warmer and shadows are more pronounced. 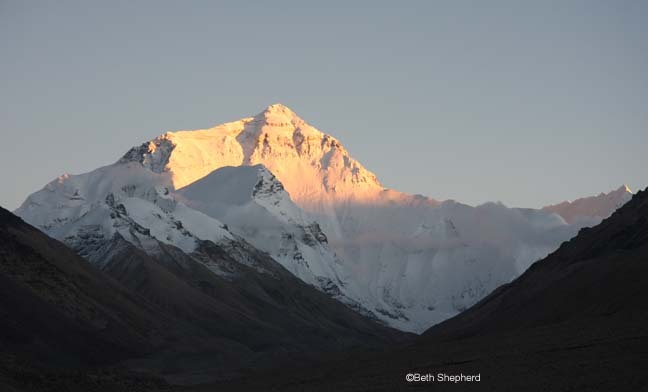 Magic hour is nearly upon Lhasa. Soon the walls of Jokang will be set ablaze in glorious hues of gold. Brilliant purples will creep into the turquoise blues of the sky. I draw in a final sip from my cup, long and slow, letting hints of pepper and cinnamon dance on my tongue. Big Papa and I head outside, through the Barkhor, to the marketplace with our guide, Tenpa. We move alongside the throngs, cobblestones underfoot. Though there is no urgency in our steps, I feel as though I’m being swept through a canyon, one buffalo in a herd of many. Legend tells that in 647 A.D. the first Tibetan king, Songtsen Gampo, built the Jokhang Temple. Its magnificence quickly attracted thousands of Buddhist pilgrims. As a result, a trodden path appeared which grew into Barkhor Street. 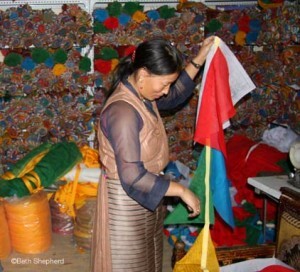 Turning to the right, we amble along Zang Yuan Road, passing Jokang Plaza and then a Tibetan prayer flag shop. Sewing machines whir and nimble fingers connect the blue, white, red, green, yellow flags, which will soon adorn buildings, streams and mountain passes. Each color, arranged from left to right in specific order, symbolizes one of earth’s elements, blue for sky, white for air and wind, red for fire, green for water and yellow for earth. 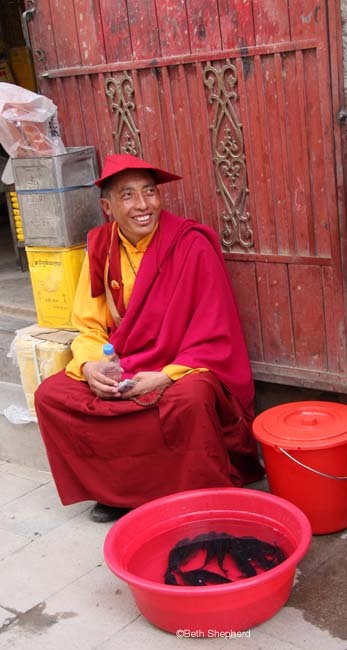 A short distance in front of us, a monk swathed in a vibrant burgundy robe squats on a corner step. A bucket of fish, nervously swimming figure eights in their tight quarters, sits at his feet. The monk watches the fish intently, glancing up on occasion. He is slim of stature with ruddy bronzed skin and broad cheekbones. Wizened eyes peer upwards in our direction as he tilts his head. “Just a moment,” Tenpa tells us as he scurries over to the monk. We watch him press a few coins into the monk’s hand. Big Papa and I think carefully about what we’ve just heard. 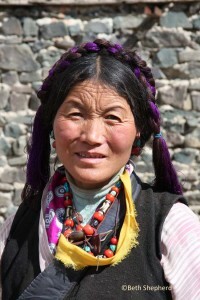 We have seen Tenpa and other Tibetans eat meat, yak mostly, but occasionally chicken or pork. However, it has not escaped our notice that none of the cafés or restaurants we’ve visited list fish on the menu. Later, during dinner, we ask Tenpa to help us understand why Tibetans eat yak, but not fish. He looks straight at us and says quite matter-of-factly, “Taking a life for such a small amount of meat is a waste.” His voice is tinged with slight annoyance. 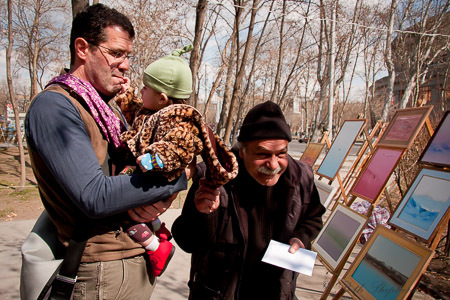 I’d venture he’s been asked questions like this innumerable times by countless travelers. It must puzzle and frustrate him that Westerners don’t comprehend this distinction. A moment passes and I catch Big Papa’s gaze. I know exactly what he is thinking. With us, we’ve brought several items which we intend to give as gifts to our guide Tenpa and our driver Chimmi, at the end of our trip. A box containing smoked salmon was selected with Tenpa in mind. Although we’d heard Tibetans did not eat meat, we somehow rationalized that fish would be acceptable. In the U.S. there are many who identify themselves as “vegetarians,” and will not touch meat from a cow, chicken or pig, but will happily dine on seafood. For many years, I was one of these vegetarians. What a rare treat, we thought. Smoked salmon transported all the way from Seattle. Certainly not something you would find in mountainous central Tibet. Little did we imagine that our carefully chosen gift might be received as an enormous insult by our gracious guide. That night, back at the Shangri-la Hotel, we tuck the smoked salmon deeper into our suitcase, and our innocent ignorance along with it. By the time we’ve returned home, it is one well-traveled smoked fish, having flown 13,442 miles, the distance from Seattle to Lhasa and back again, not to mention the multi-day side trip all the way to base camp at Mt. Everest. This fish has been from below sea level to the top of the world. I blink and open my eyes, returning to the moment. Big Papa is elbow deep in his luscious ribs. Outside the window, rain is pouring down fiercely. I see green and trees. I know the mountains behind the clouds are not the Himalayas. At tables on all sides of me, people are speaking English. 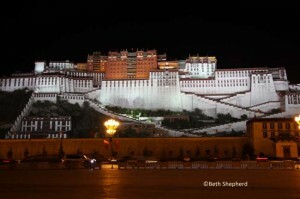 I take a long, slow sip from my glass of northwest Pinot Noir just as I’d sipped Masala tea in Lhasa. A second glass, filled to the brim with tap water and ice, is right in front of me. It is the first time in nearly a month that I’ve been able to safely drink water that is not bottled. Discarded mussel shells lace the rim of my pure white bowl, like a necklace. Om Mani Padme Hum. The words reverberate just below the surface of my conscious mind. I contemplate the meaning of this chant I heard hundreds, if not thousands, of times during our trip. According to Buddhists, this six syllable mantra means, “in dependence on the practice of a path which is an indivisible union of method and wisdom, you can transform your impure body, speech, and mind into the pure exalted body, speech, and mind of a Buddha.” After a journey of many thousands of miles in this life, I still have many miles and many lives left to travel. 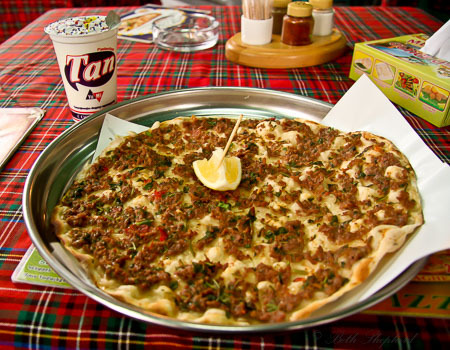 Check out the WanderFood Wednesday series for more great food postings! “Breeep, breeep, BREEEP!” The sharp piercing staccato of our fire alarm fills the airspace. Big Papa and I are making Shepherd’s Pie from scratch and setting off the fire alarm is part of our annual tradition. For each of the five Christmas seasons we’ve been a couple, Shepherd’s Pie has been on the menu. I got the idea since Big Papa is a ‘Shepherd.’ Now that I’m his Missus, I’m a Shepherd too. I searched many blogs and scoured cooking sites reading recipes and trying to find the one with glowing reviews. 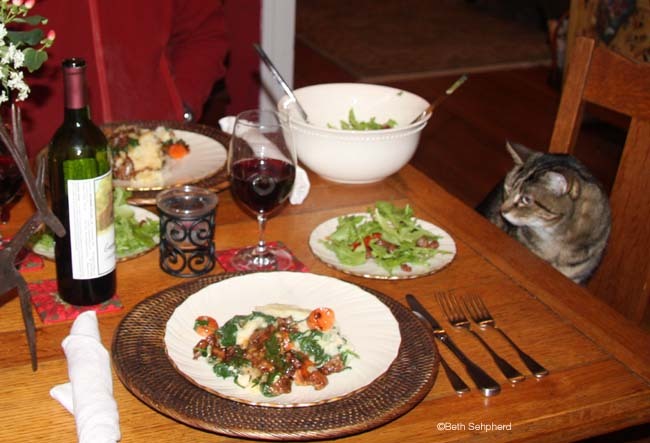 Gourmet Magazine, February 2001, Braised-Lamb Shank Shepherd’s Pie with Creamed Spinach was the winner. This particular Shepherd’s Pie takes an entire day to create. The dish calls for several layers: mashed potatoes, creamed spinach, roasted carrots, and gravy. Mid-way through the day, our kitchen is piled a mile-high with pots and dirty dishes. It’s hard to believe all this mess will result in a truly amazing meal. Six hours of work later, all this divine deliciousness will land in one baking dish. Big Papa helps. He picks off the pieces of lamb after it’s been roasted three times. Yes, three times. The roasting is part of the process which inevitably sets off the fire alarm. We laugh about the alarm and, truthfully, something would feel amiss without it. A few herbs from our winter garden add backyard flavor: thyme and rosemary and sage (though sage is not listed in the recipe). Despite the prep being labor-intensive, it’s a relaxing way to spend the day. We open a bottle of champagne to drink while cooking and take breaks to open gifts or make phone calls to family. Making Shepherd’s Pie for the Christmas holiday is one of the first traditions Big Papa and I started together. I like feeling a small connection to ‘shepherds’ who have come before us and shepherds around the world. 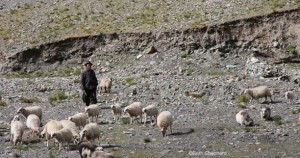 Last fall, when we toured Tibet, we saw many shepherds high in the Himalayas herding sheep and yak. Stopping at one mountain pass, two shepherd boys approached us. Our guide, Tenpa translated for us and we told the boys our ancestors, many generations ago, were also shepherds. As our Shepherd’s Pie bakes, it fills the Urban Cabin with a wonderful aroma. When it’s ready to eat, we light candles and sit in our cozy, deep red dining room to enjoy this meal. Big Papa picks out a good wine from our “cellar” – aka the dirt floor basement of the Urban Cabin. Maggie, the cat, sidles up to the table. We talk about Shepherd’s Pie making past. Remember last year when…each year has its own unique story. I am completely at peace. Despite several challenges this year, we are so fortunate to be able to enjoy such simple pleasures: the Urban Cabin, a good meal and each other. Put lamb shanks in a large metal roasting pan, then rub with oil and season with salt and pepper. Arrange onion wedges around lamb. Roast lamb in middle of oven 40 minutes. Turn shanks over, scatter with herb sprigs, and roast 40 minutes more. Pour wine, broth, and water into roasting pan. Cover pan tightly with foil and braise lamb until tender, 45 minutes to 1 hour. Transfer shanks to a plate and remove and discard skins from onions. Pour cooking liquid (including onions) into a large glass measure (do not clean roasting pan). Pierce each potato once with a fork and bake on rack in lower third of oven until cooked through, 45 to 50 minutes. Cool potatoes 10 minutes, then halve lengthwise and scoop out flesh. Force warm potatoes through ricer into a bowl. Stir in salt, milk, and pepper to taste. Cook carrots in boiling salted water until tender, about 10 minutes. Rinse under cold running water to stop cooking. Skim fat from cooking liquid (you’ll have about 2 1/2 cups broth). Whisk together 1 cup broth and flour in a large bowl to make a thin paste, then whisk in remaining broth (including onions). Set roasting pan across 2 burners and pour broth mixture into pan. Boil over moderate heat, whisking, until thickened, about 5 minutes. Remove from heat and season with salt and pepper. Cut lamb meat from bones, then tear meat into bite-size pieces. Stir meat into gravy. Spoon lamb-shank mixture into a 12- by 3-inch oval gratin dish or a 2 1/2- to 3-quart shallow baking dish, spreading evenly. Scatter carrots over lamb, then top with creamed spinach, spreading evenly. Top spinach with mashed potatoes, spreading evenly to edges of dish to cover filling completely. Make swirl patterns on surface of potatoes with back of spoon, then drizzle with melted butter. Put baking dish in a foil-lined shallow (1-inch-deep) baking pan to catch drips and bake until top is golden and filling is bubbling, about 1 hour. Lamb shanks can be made 1 day ahead of assembling shepherd’s pie and chilled, covered. Bring to room temperature before proceeding. Mashed potatoes can be made 1 day ahead of assembling shepherd’s pie and chilled, covered. Bring to room temperature before proceeding. Shepherd’s pie can be assembled (before being drizzled with melted butter) 1 day ahead and chilled, covered. Let stand at room temperature 1 hour before drizzling with butter and baking. Cook spinach in 1 inch of boiling salted water in a large pot, covered, stirring once or twice, until wilted, 1 to 2 minutes. Drain in a colander and rinse under cold running water until cool. Squeeze small handfuls of spinach to remove as much moisture as possible, then coarsely chop. Cook onion in butter in a small heavy saucepan over moderately low heat, stirring, until softened, about 4 minutes. Whisk in flour and cook, stirring, 2 minutes. Add warm milk and simmer, whisking, 3 to 4 minutes. Whisk in parmesan, salt, nutmeg, and pepper to taste. Add spinach and cook, stirring, until heated through. 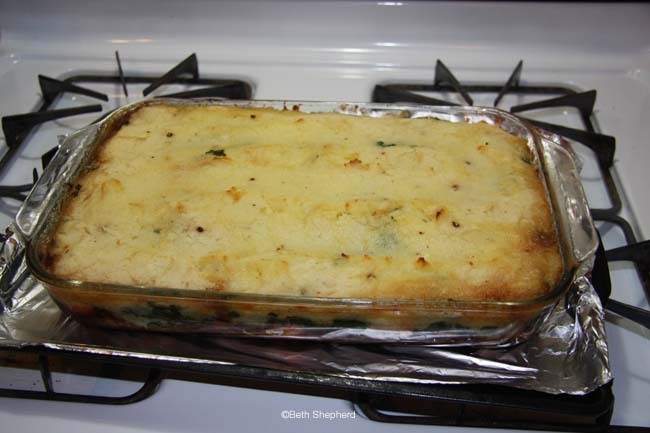 Spinach can be made 1 day ahead of assembling Shepherd’s pie and chilled, covered. Bring to room temperature before proceeding. This past October, my husband (hereafter referred to as Big Papa) and I were fortunate enough to be able to visit Tibet. He was completing a work project that required a trip to Beijing and I decided to join him. We talked about taking additional time for a vacation after the project launched. Initially we considered Yunnan, after a friend of mine traveled there and told us about the diverse ethnic groups who live in that province. Looking at the map, I noticed it wasn’t much farther to Tibet. One of Big Papa’s lifelong dreams was to see the Himalayas, so I angled for Tibet. We chose Wisdom Tours to guide us (independent travel is not allowed in Tibet), because they use Tibetan guides and we wanted an authentic perspective. 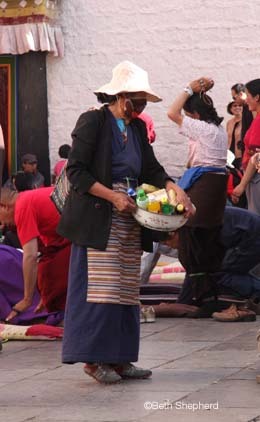 Our itinerary included a few days in Lhasa, with visits to the Barkhor market, Potala Palace (where Dalai Lamas lived for centuries) and Jokhang Temple, along with stops at monasteries and smaller towns as we wound our way through the countryside until we reached the highest spot on earth, Mt. Everest. We were unbelievably excited to see Everest. All the rest was the cherry on our sundae. We arrived on September 26. The elevation at Lhasa is 12,000 feet. Climbing the stairs to our hotel room left us breathless. That afternoon, we strolled through the Barkhor market. Buddhist pilgrims, many who had traveled thousands of miles, circumambulated clockwise around Jokhang Temple, one of the holiest temples in Tibet. They spun hand-held prayer wheels, sending prayers to the heavens. Clouds of juniper incense perfumed the air. Colorful prayer flags adorned every rooftop and waved their rainbow of mantras between every building. Monks in beet red robes mingled with the throngs of tourists. Golden rooftops of the temples rose to a crystal clear turquoise sky. Two days later, a bit more acclimatized to the altitude, we began our four-wheel trek to Everest. On the way, we passed tiny mountain outposts. We saw villagers, faces bronzed and filled with lines from hard labor in harsh conditions. 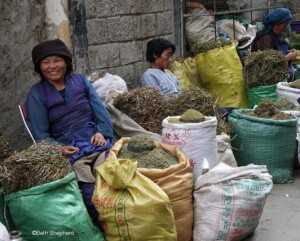 Tibetans live simple lives in humble dwellings. They are devout in their beliefs and practices which are woven through every aspect of their lives, like the warm colors in a Tibetan rug. Visits to several monasteries were mesmerizing. 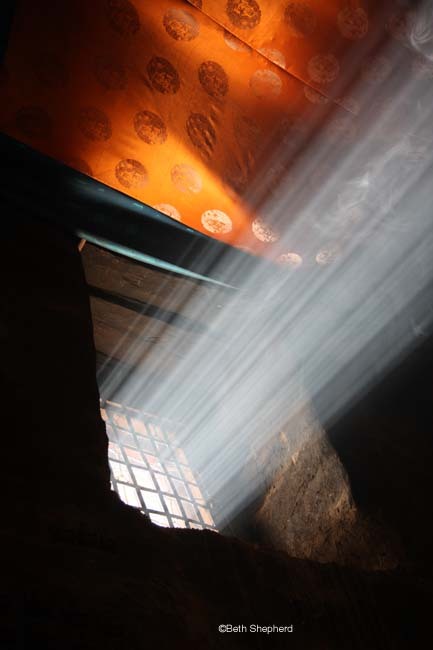 Monks chanted so deeply, I could feel my chest vibrate. Rich saffron orange walls and a king’s ransom of coral, turquoise and precious stones adorned golden Maitreya Buddhas and Taras. Salty yak butter tea was served to us by playful monks who scratched Big Papa’s beard and laughed. The food was surprisingly good. Thick, tangy yogurt laced with honey. Ginseng roots slathered with rich yak butter and tossed in rice. Hearty yak nestled beside carrots and potatoes in a tasty stew. We did not expect to write home about the cuisine and yet , here we were, praising each meal and looking forward to the next. We headed skyward, driving by nomads herding noble yaks in remote vistas of spectacular beauty. 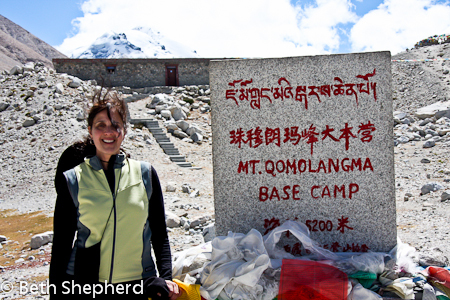 Three days later, we arrived at Chomolangma National Park (Chomolangma means ‘Goddess Mother of the Universe’ in Tibetan). We hiked the final three miles in to base camp, at 17,000 feet. Finally, we stood facing the mountain, in all her glory. Seeing the Goddess Mother of the Universe is awe-inspiring. I will never forget the time we spent in her shadows. There is something indescribable about being in that place, achieving a dream, traveling the distance and seeing the unimaginable. It was only nine days and, at the same time, it was life-changing. Had we not experienced the days preceding that moment, I’m not sure it would have meant as much. 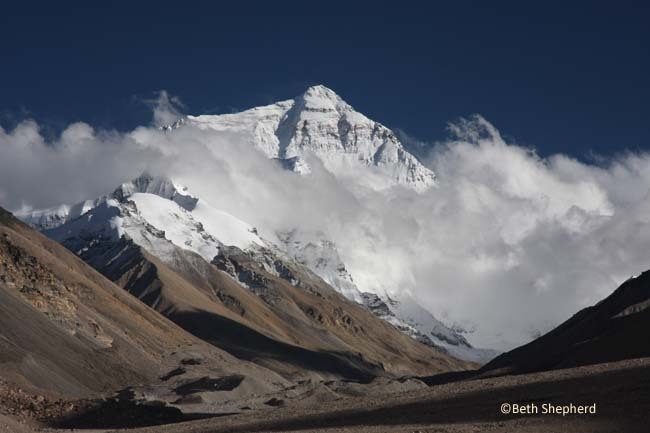 Before our trip, visiting Everest was a mere dream. Now it was 29,000 feet of rock solid reality. And, we understood more about Goddess Mother by learning about her people and the land beneath her snowy base. Our trip to Tibet and Mt. Everest has many parallels with our adoption journey. Becoming parents is a long-held dream. The road to adoption covers many miles and is very steep. There are many obstacles en route and the unexpected greets us around every corner. With each step, we learn more. We work hard together as a team. There are times of laughter and also times when we have shed many tears. As we make our way, we craft an incredible story. A story we hope to share one day with our child as we encourage him to pursue dreams of his own.